Натисніть на фотографію і подивіться всі доступні фотографії до Hotel Azzurra. American Express, Maestro, Visa, CartaSi, Euro/Mastercard, Diners Club, JCB, PIN. This classic-style room is provided with free Wi-Fi, a flat-screen TV, and an en suite bathroom with free toiletries. Some rooms also have a private balcony. 2 Задасте дату а виявите наявність, зобразяться а й ціни готелів на даний час. This classic-style room is provided with free Wi-Fi, a flat-screen TV, and an en suite bathroom with free toiletries. Some rooms also have a private balcony. 3 Задасте дату а виявите наявність, зобразяться а й ціни готелів на даний час. This classic-style room is provided with free Wi-Fi, a flat-screen TV, and an en suite bathroom with free toiletries. Some rooms also have a private balcony. It comes with a double bed and bunk beds. 4 Задасте дату а виявите наявність, зобразяться а й ціни готелів на даний час. This classic-style room is provided with free Wi-Fi, a flat-screen TV, and an en suite bathroom with free toiletries. Some rooms also have a private balcony. This room includes 1 parasol and 2 sun loungers. 2 Задасте дату а виявите наявність, зобразяться а й ціни готелів на даний час. This single room features air conditioning and tile/marble floor 1 Задасте дату а виявите наявність, зобразяться а й ціни готелів на даний час. This double room has a electric kettle, air conditioning and tile/marble floor. 2 Задасте дату а виявите наявність, зобразяться а й ціни готелів на даний час. Set just 50 metres from the coast and its beaches, Hotel Azzurra offers free WiFi throughout. It features air-conditioned rooms and free bicycle rental. The rooms have a classic décor and are fitted with wooden furnishings. Each is provided with a flat-screen TV and an en suite bathroom with free toiletries. At the Azzurra Hotel you can start the day with a continental-style breakfast including croissants, pastries, cold cuts and cheese, together with hot drinks. You have discounts at a partner private beach which you can reach on foot. The hotel’s café is open from 08:00 until 00:00 and it only serves drinks. 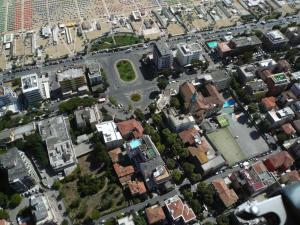 Rimini Train Station is less than a 15-minute walk from the property. Riccione with its popular discos, is a 20-minute drive away.